Pray tell to me, kind sir, is he alive or dead? It’s expected any moment, that death wil claim it’s own. The Minnesota Historical Society has an oral history interview made in the 1950s with Mary Orr O’Neill who cooked meals in her father’s lumber camps on Tamarac River, Loon Lake and Sioux Portage, Wisconsin in the 1880s. In it, Orr O’Neill recalls hearing several songs in her father’s camps including “Johnny German.” Versions of this song were once sung across the Great Lakes and in the Canadian Maritimes as well as in Ireland where Sam Henry collected a version. 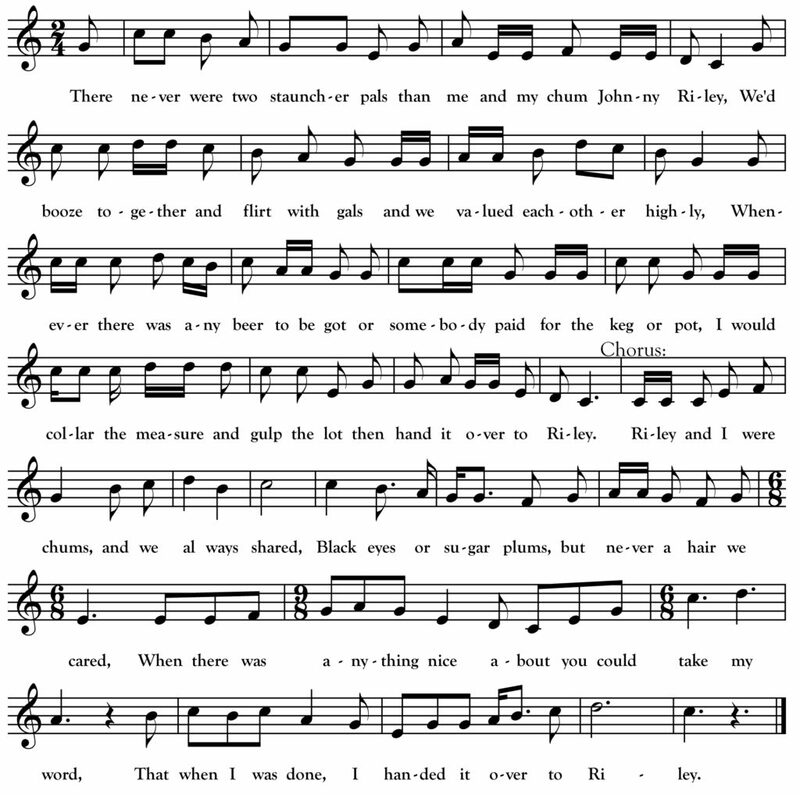 The above text come from an unpublished typescript compiled by New York singer Joseph McGinnis in the 1920s and titled The Songs of the Dogwatch. The melody is adapted from McGinnis as well with some modifications (McGinnis did strange things with key signatures and rhythm that I believe are more a function of his understanding of staff notation than a representation of what he actually sung). Like the more well-known “Banks of Claudy,” “Johnny Jarmin” is what folklorists term a Riley Ballad—a story in which a man leaves his girlfriend behind, returns years later and tests her faithfulness by pretending to not be who he is. I was first introduced to this plot line as a kid by Rob Reiner’s 1987 cult classic The Princess Bride which I must have watched a thousand times. The trick seemed cruel, confusing and strangely romantic to me then and now. I think McGinnis’ “Johnny Jarmin” deals with the resolution in a very satisfying, poetic way. And toward a rich plantation my steps I slowly bent. Now I’ll sing a song of old Ireland for to drive dull care away. She wore the robes of innocence, her dress was snowy white. And her rolling eye attracted me, her cheeks were like the rose. And that I belonged to that brigantine that laid anchored in the Bay. And we all sat down together, spent a jovial afternoon. 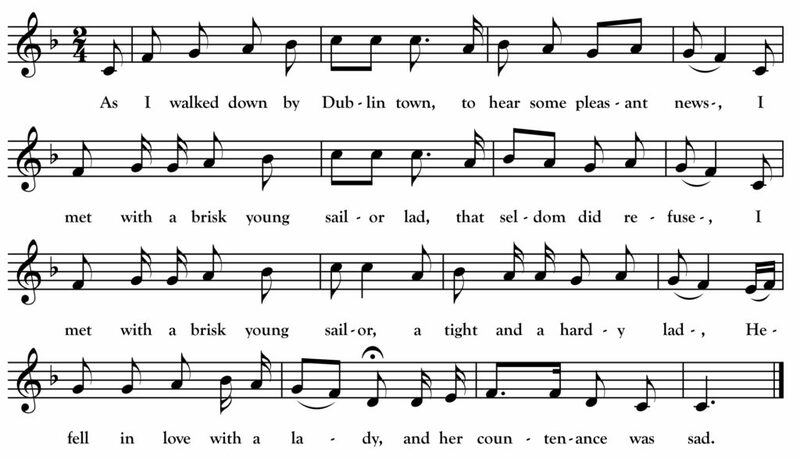 Michael Dean (the same Irish-Minnesotan featured often in this column) was one of hundreds of American and Canadian readers of “Old Songs” who sang and pursued traditional folksongs with the help of the far-flung community of singers and amateur collectors brought together by the column and its enthusiastic editors. Dean corresponded by letter with “Old Songs” editors Robert Frothingham and Robert Winslow Gordon as well as other “Old Songs” readers and contributors (the column ran song texts sent in by readers responding to published requests). In addition to published requests and contributions, Dean swapped songs with these people directly by mail. It was this correspondence that ultimately led to Gordon travelling by train with his wax cylinder recording machine to record Dean’s singing in 1924. 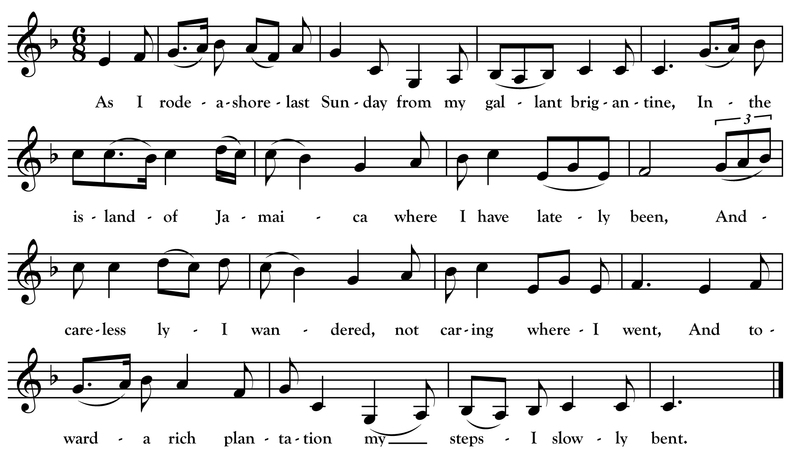 We do not know if Dean ever tracked down a complete version of “The Gallant Brigantine” (he did manage to get a version of “Paul Jones, the Privateer” and sing it for collector Franz Rickaby the following summer). The version above is transcribed primarily from Alan Lomax’s 1938 recording of Beaver Island, Michigan singer Johnny W. Green with a few tweaks inspired by other versions found in the Canadian Maritimes. It is a peculiar song with an almost punchline-like ending. Not the typical conclusion to a story like this!